A marble bust, reputitly o Hannibal, oreeginally foond at the auncient ceety-state o Capua in Italy (some historians are uncertain o the authenticity o the portrait). 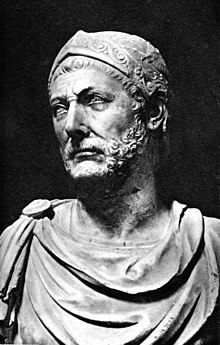 Hannibal, son o Hamilcar Barca (247 – 183/182/181 BC) wis a Punic Carthaginian militar commander, generally considered ane o the greatest militar commanders in history. His faither, Hamilcar Barca, wis the leadin Carthaginian commander during the First Punic War, his younger brothers wur Mago an Hasdrubal, an he wis brither-in-law tae Hasdrubal the Fair.